Marilyn Stasio in The New York Times raved: 'Peter May is a writer I'd follow to the ends of the earth.' 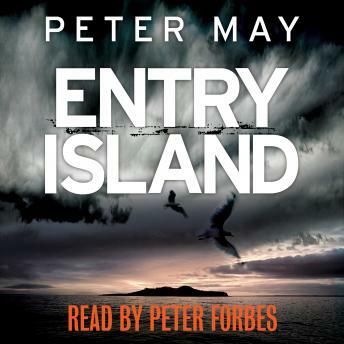 Now Peter May takes us to a small island off the coast of Québec with an emotionally charged new mystery. When a murder rocks the isolated community of Entry Island, insomniac homicide detective Sime Mackenzie boards a light aircraft at St. Hubert airfield bound for the small, scattered chain of Madeline Islands, in the Gulf of St. Lawrence, as part of an eight-officer investigation team from Montréal. Only two kilometers wide and three long, Entry Island is home to a population of just more than 100 inhabitants, the wealthiest of whom has just been discovered murdered in his home. Covered in her husband's blood, the dead man's melancholy wife spins a tale for the police about a masked intruder armed with a knife. The investigation appears to be little more than a formality--the evidence points to a crime of passion, implicating the wife. But Sime is electrified by the widow during his interview, convinced that he has met her before, even though this is clearly impossible. Haunted by this strange certainty, Sime's insomnia is punctuated by vivid, hallucinatory dreams of a distant past on a Scottish island 3,000 miles away, dreams in which he and the widow play leading roles. Sime's conviction soon becomes an obsession. And despite mounting evidence of the woman's guilt, he finds himself convinced of her innocence, leading to a conflict between the professional duty he must fulfill and the personal destiny he is increasingly sure awaits him.